Atlanta new home builder Traton Homes just announced that it will build nine Cobb County new homes at Cook’s Farm in Kennesaw, a beautiful established community in the Harrison High School district. Cook’s Farm boasts an elegant streetscape, and the homes Traton is building will feature attractive elevations with three-sides brick, cedar shake and/or stone exteriors and side-entry garages with carriage-style doors. These homes will be priced from the mid-$300,000s and will be available soon. You’ll love showing of your new home. Interiors will feature luxurious owners’ suites and gourmet kitchens with finishes like stainless steel appliances and granite countertops and maple cabinetry. Plus, these Traton Homes will be in the middle of it all. Cook’s Farm is in a great Cobb County location, convenient to top-notch schools, shopping, dining, entertainment and recreation. Homeowners will enjoy quick and easy access to West Cobb County, including The West Cobb Avenue, Lost Mountain Park and the Northwestern YMCA. Children living at Cook’s Farm attend excellent area schools including Bullard Elementary, McClure Middle and as mentioned above, Harrison High schools. To visit the community, take I-75 north to Barrett Parkway (exit 269). Turn left off the exit and travel 3.2 miles to Stilesboro Road. Turn right onto Stilesboro Road, and then turn left onto Acworth Due West Road. Cook’s Farm is on the left. 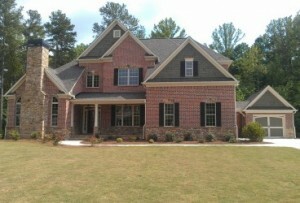 For more information on Cook’s Farm, call 770-590-8272 or visit www.TratonHomes.com. This entry was posted in Green News, News and tagged cobb county new homes, cook's farm, kennesaw, traton homes on June 28, 2012 by admin.